Above: A statue of the Duke of Wellington at Bank Junction. It was made from enemy cannons captured during Wellington's victories in the Napoleonic Wars. Once again walking eastward, you come to the fortress-like Bank of England. Begun as a private institution in 1694, the Bank is now an independent public organization owned by the British government. 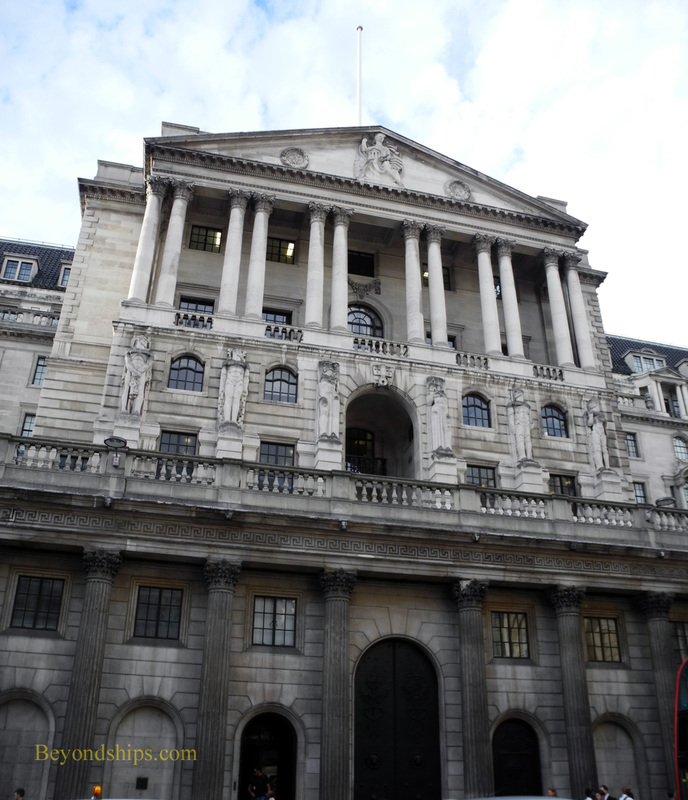 The Bank of England is the United Kingdom's central bank. It sets monetary policy for the country with the aims of maintaining price stability and promoting economic growth, The Bank also issues bank notes for England and Wales. In addition, in its vaults are the gold reserves not only of the U.K. but of several other nations. The building fronting on Threadneedle Street (hence the Bank's nickname “The Old Lady of Threadneedle Street”) was originally designed by Sir John Sloane in 1788. However, the interior was largely gutted and rebuilt in 1921. The building occupies a three acre block. Across from the Bank at Bank Junction is the Royal Exchange. In the 17th century, merchants and brokers met in the City's fashionable coffee houses to trade commodities and exchange notes. Similarly, the insurance industry began in places such as Lloyd's Coffee House. Over time, the trading and insurance writing became more formalized and migrated to purpose-built exchanges. The Royal Exchange was one of several exchanges in the City. 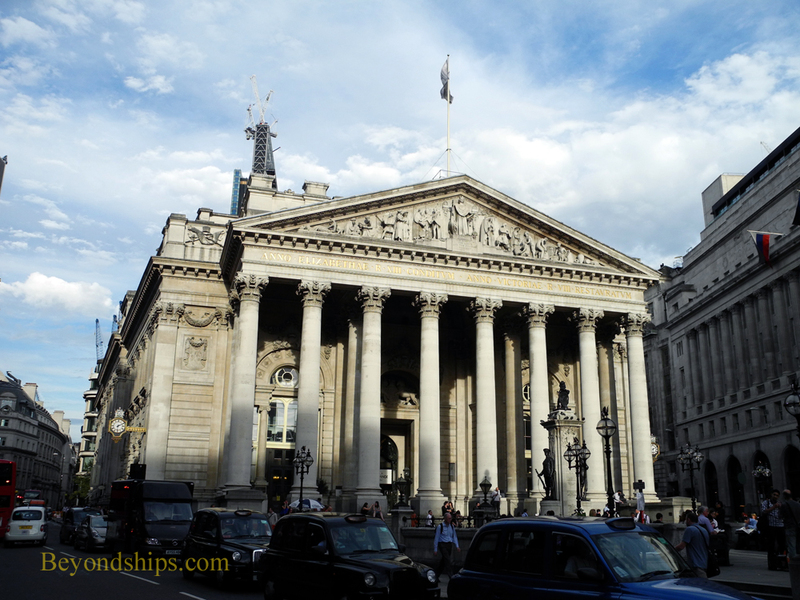 The Royal Exchange Building we see today was opened in 1844 by Queen Victoria. It was used by Lloyd's until 1925. Today, it is a retail center with shops and boutiques. 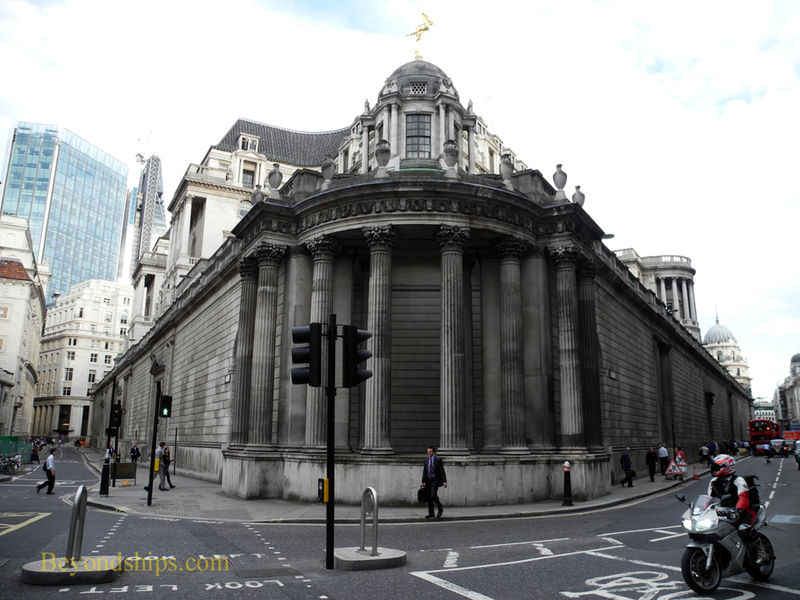 Also at Bank Junction is the official residence of the Lord Mayor, Mansion House (not shown). During the latter part of the 20th century, the derelict warehouses and wharves along the Thames east of the City were re-developed into modern office buildings. The rents charged for these new buildings were much less than those charged for office space in the City and so businesses started moving from the City to this new location and a competing financial center was born. This competition created pressure to build equivalent office space in the City. As a result, new glass-walled skyscrapers have appeared changing the skyline of the City. 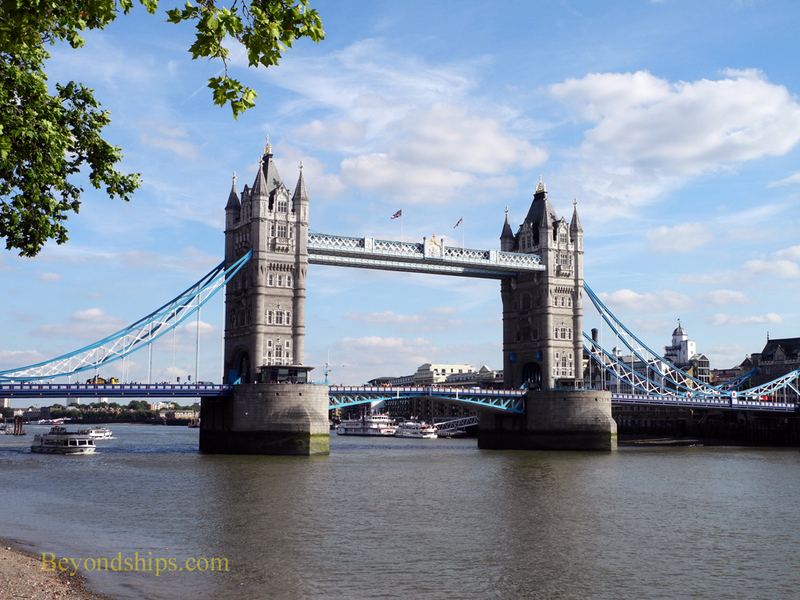 Heading southeast, we come to the Tower of London and the River Thames. 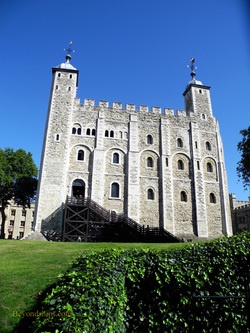 The Tower is not actually in the City but it is a magnet that draws visitors to the area (see separate article). 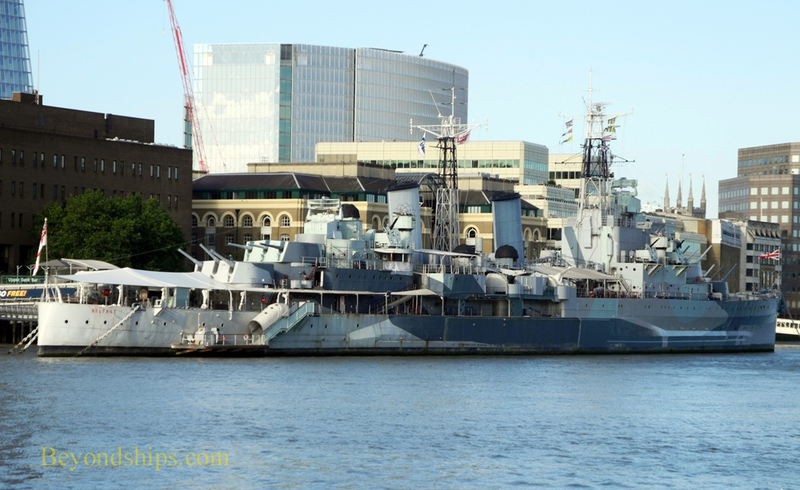 Other nearby attractions include Tower Bridge and HMS Belfast, a World War II cruiser, which is permanently moored in the Thames. 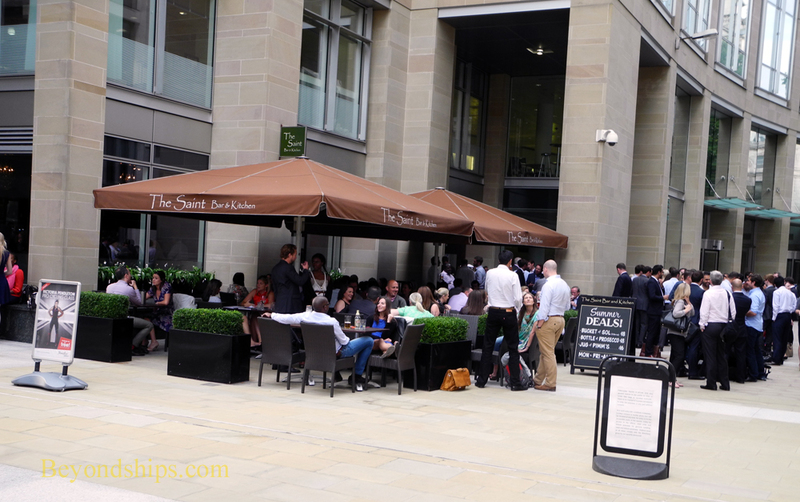 In addition to the landmarks that we have seen on this walk, the City has numerous pubs and cafes. At the close of the working day, it is not uncommon to see throngs of office workers overflowing from these establishments out onto the sidewalk. The City is lively and busy during the week. Since most of the people who work here live elsewhere, on weekends, it is a much quieter place. 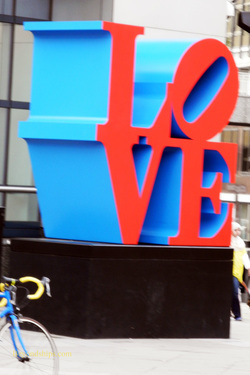 Thus, while it is easier to stroll on the weekends, it is easier to get a feel for the City during the week. 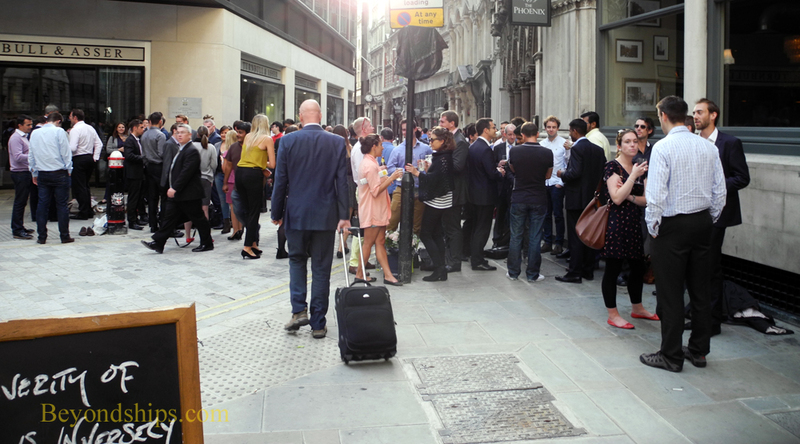 Above and right: City workers unwind after work.